Employing a variety of techniques, including free-machine embroidery, hand embroidery, painting, dyeing, quilting, felting beading, wirework and applique, she recreates items such as bags, shoes, gowns, hats, even cups and lampshades in organic form, reflecting the intricacy and exquisite beauty of the natural world and instilling them with a dreamlike quality evocative of fairyland. 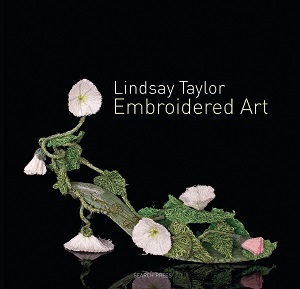 The emphasis of this book is placed firmly on showcasing Lindsay's unique style of embroidered art, with an extensive gallery taking up three-quarters of the book and containing beautiful photographs and intriguing close-ups of her work. The introductory section provides an insight into her life journey - the evolution of her unique style of work, her inspiration, and the methods and materials she uses.